To those serious Star Wars fans out there, please believe me when I say I mean no disrespect and I admit up front that there are some days I just shouldn’t go see a film (like the ill fated, rainy evening I viewed The Thin Red Line: but, that’s another blistering post). Here’s the problem: I usually don’t recognize I’m in one of my “moods” until about ten minutes into the movie and by then, it’s too late. The first offense was a large aerial battle with about fifty million different craft and drones and space junk flying all over the place. It was just too much: an ostentatious show of what a pre-teen mind would produce, if he could get his hands on the hardware at Industrial Light & Magic. This was a distraction, which would surface over and over again as the film played out. That leads me to the next major irritant: since we were viewing the film long after its release, the Del Oro Theaters had moved it into one of the smaller, cheesier, side theaters. Admit it: when you go to see a Star Wars adventure, you arrive with certain expectations. The most important part of the experience for me will be visual special effects, then high quality sound, followed by lots of action, interesting story, some decent characters and, finally, fairly believable dialogue (actually, I never expect that last one, but it would be icing on the cake). Here’s the problem: the SOUND WAS DREADFUL! It was stereo, from the screen with maybe a little low end going on, but that’s it. No surround! What? Star Wars – no surround? Barbaric. I literally heard the rear speakers of the big auditorium, on the other side of our screen, reverberating with the state-of-the-art sound from the new Batman film. I was thinking to myself, “I wish we’d gone to see Batman instead.” Perhaps the Revenge of the Sith will be redeemed when viewed at home in Dolby surround, with volume up to 11. I’ll have to try that. Okay, so we’ve lost the sound… There’s still the special effects to salvage the movie. Wrong. As I mentioned earlier, up-post, I was immediately struck by the sheer volume of “really cool” fighters and stuff flying around in the opening scenes. But, sooner or later those craft had to land and that would lead to another oft-repeated, tedious nuisance. With every arrival, droids would walk by, fly in or roll out to greet the spacecraft or unload cargo. And, then I noticed these droids were all different. It’s like I was viewing some crazy advanced culture, where they could come up with expensive, ingenious prototypes of every kind of robot imaginable, but somehow couldn’t master the simple technologies involved in standardization or mass production. Maybe none of these droids were as successful as, say, the clones or R2D2 or the protocol droids and were consigned to being cargobots or “set extras” in a Lucas space flick. Or, the more likely explanation is that the adolescent special effects guys at IL&M couldn’t resist piling on one more magnificent droid creation after another. When the guys in the Jedi council are discussing serious matters, I found myself cracking up as I scanned that “august body” — I couldn’t take them seriously, because some of them just looked ridiculous. I completely lost it when the camera panned to a guy who looked like an elderly version of Beldar the Conehead from Saturday Night Live. I mean, really? He even carried himself like Dan Akroyd would, which lead me to wonder if there’s something common to the conehead makeup or costume, that requires the actor to walk stiffly and turn his/her entire body, when looking in different directions. And, this is the sad part. When Order 66 (or whatever it was) was issued and the traditionally hapless storm troopers, with poor weapons skills, start effectively and methodically assassinating the Jedi masters (another story problem), I found myself anxiously anticipating Jedi Knight Beldar getting zapped and let out a muffled cheer when he finally got whacked. Who could have imagined that I would find myself sympathizing with the storm troopers?!? The Revenge of the Sith pushed me over the edge to the dark side. Speaking of Jedi gaffs and guffaws. Did anyone else find it just plain wrong to have a wise-cracking Obi-Wan Kenobi in the film? I mean, when Han Solo rolled his eyes and clowned around in the good old days, it was appropriate… he was playing a rebel, galactic James Dean of sorts. But, there was just something wrong seeing Obi-Wan yucking it up with young Anakin, after crash landing half a space ship, burning from reentry, with firecraft squirting it with foam at roughly 200 MPH. Then, it took out at least one control tower containing hundreds of expensive droids (all unique prototypes of course) and probably hundreds of computer generated beings, representing scores of species. Why would he jump out of the ship cracking jokes? Perhaps the Emperor was doing the universe a favor, when he dissolved the Jedi comedy council. Which leads me to Anakin’s move to the dark side. If I had been tortured by the stilted, boring, pedantic lectures Anakin was subjected to by Obi-Wan and the Samuel Jackson Jedi character,perhaps I would have been driven to the dark side myself. There’s nothing worse than a robed, wisecracking, monkish Al Gore type, wagging his finger, and droning on and on, with a first grade vocabulary. My light saber would have been out of its holster in a flash and I would be decapitating every one of those hooded, inter-galactic Mr. Rogers Jedi Masters! Finally, I was emotionally flat-lined through the entire film until the Emperor stooped to the lowest level any space scum could possibly descend to. Yes, one scene brought me to life and filled me with righteous indignation. The final irritant in the movie I can only describe as Muppet abuse. 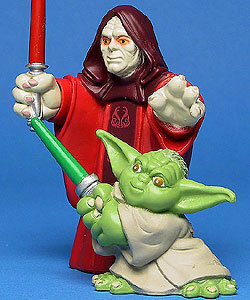 When the Emperor started picking on poor Yoda, the little fella had my sympathy. I revived, leaned forward in my theater seat, brushed off the popcorn debris, and my lower lip began trembling with emotion (you know, like Stimpy’s does whenever he experiences some passion). But, my indignation turned to laughter as I watched the little Yoda puppet figure sail through the air, slam up against the wall, and fall limply to the floor, as I had seen so many Muppet figures tossed about on their television show 25 years ago. You know the drill: the Chef or Beaker would blow something up and the Muppet puppeteers would hurl their puppets, arms and legs flailing, across the set. Yes, that was entertaining on the Muppet Show, but in a dramatic film? It didn’t work for me. I looked at Denise and said, “You know, Yoda needed a cane just to get around before… I can’t imagine how he will ever be able to move after being catapaulted against that metal bulkhead with the full force of the Emperor!” Yet, miraculously… well, you know the rest of the story and it’s just not believable. Am I being a little too harsh on Mr. Lucas, the creative crew or the cast? I don’t think so. I made about a dozen wisecrack observations to Denise throughout the film and normally she would shsssssh me. During the Revenge of the Sith, she either responded in hushed verbal agreement or gave me the knowing, matter-of-fact “Joe Friday” nod, letting me know that we’d just witnessed the ridiculous. Anyways, when he dies in Return of the Jedi (we watched it last night) he is so cute and adorable. I want to scoop him up in his little blankie and squeeze him. Bo, that was the funniest review of all time! Don’t be surprised if my son leaves our church over this. You’ve gone to far this time. Lol! That was a pretty funny review, although, I actually did like the movie. However, I read the script beforehand so I knew the dialogue was awful so I just sat back and watched the action. Yes, Yoda was way more cool in the original series. I’d take puppets over CGI any day, even though computers put food on the table for us. Remember now, I began by saying it’s probably a fine film and I was in a “mood” when I went to see it. Also, sound is a HUGE factor to me… I love high quality audio (I could never understand how pro musicians could stomach such horrible home audio equipment). My criticisms are actually pretty minor and probably would have gone unnoticed, if the sound was good and they didn’t start cascading the CGI stuff out at the beginning. One thing, also. Everyone said this one was more violent or something. I’m sorry, but I can remember way back and I think the most frightening creature I ever saw in a Star Wars episode was that giant thing Jaba the Hut was feeding his enemies to! I imagine there are still grown up children everywhere who get goosebumps whenever they hear a pig squeal! Dan and I watched The Empire Strikes Back and you know what was really scary? That beast that attacked Luke and strung him up by his ankles in his cave. He was wicked looking! Bo, your breaking my heart! Sadie turned against me, don’t you turn against me too! …but I still love you Levi. I appreciate your candor, Bo. Obviously the dark side has clouded young Levi’s mind so that he believes Revenge of the Sith was actually a good movie. I take all your points. I tended to let them pass by though and tried to enjoy the movie. What I really found difficult to swallow though was Anakins seduction by the dark side. I found the whole process of the Emperors seduction to be hamfisted and just not very convincing. Mr Lucas sure knows how to put on a good laserfight or adventure but when it comes to political intrigue and human nature when it comes to power, greed and motivation he should have brought someone else in to help. I understand Anakin wanted to save his Padme from the death in his dreams, but I dont think it would be enough to enthrall someone into usurping absolute power and destroying the Jedi council. I would think the desire for absolute power would have been the driver for that in itself, I would have found more convincing the age-old desire for power rather than a sort of last ditch effort to potentially one-day learn the power of healing. In any event Padme dies, why doesnt Anakin then revert, yes it is rather too late to return things to how they were, but if the main reason for him moving to the Dark Side no longer exists anyway, whats the point in continuing. Bold call on the “up to 11” line. A louder 10 might be nice, but nothing beats going to 11.